2. Place tomatoes in baking dish and add garlic, salt, pepper, chilli, oregano, and olive oil, using your hands to evenly coat the tomato halves. Ensure all halves are face up. 3. Place baking dish into preheated oven for 20 minutes. 4. Meanwhile, cook spaghetti as per packet instructions. 5. Remove tomatoes from oven and crush each tomato half with a fork to get the juices out. 6. Rip basil into small pieces and add to tomato sauce. 8. 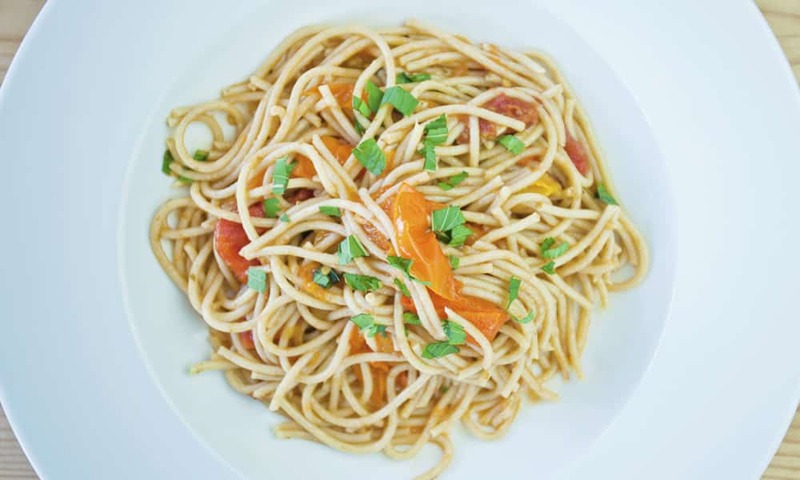 Fold spaghetti into tomato sauce until fully combined, then serve and top with chopped basil.